Poetry In Motion is a collaboration of dance, poetry recitation, and music. Artistic Director, Sachiyo Ito, will be joined by the guest artists, Jamie Sieber, the cellist and vocalist, and Kim Rosen, spoken word artist from the west coast. Together, they will offer a concert of music, dance, and poetry from ancient and modern mystical sources, speaking the language of the soul, and carrying us into deeper connection with ourselves, others, and the world. This is day 2 of the Downtown Dance Festival. Performances at Governors Island are scheduled from 1pm to 5pm. For festival details, see the Battery Dance Company website. For Governor’s Island information, including the ferry schedule, see the Governor’s Island website. This topic was well received in the 2005 Salon Series No. 23, and audiences have continued to ask for a repeat. To meet this popular demand, Salon Series No. 32 will present Renku and Dance again. Following rules for Renku (linked verses) established in the 16th century, haiku and dance are linked and alternated as one inspires the other in improvised performance. William Higginson, Penny Harter, John Stevenson, the members of the Haiku Society of America, will join in the program. Also, live music accompanying the dance will be improvised by three musicians, Masayo Ishigure on koto, James Nyoraku Shlefer on shakuhachi, and Yukio Tsuji on percussion. 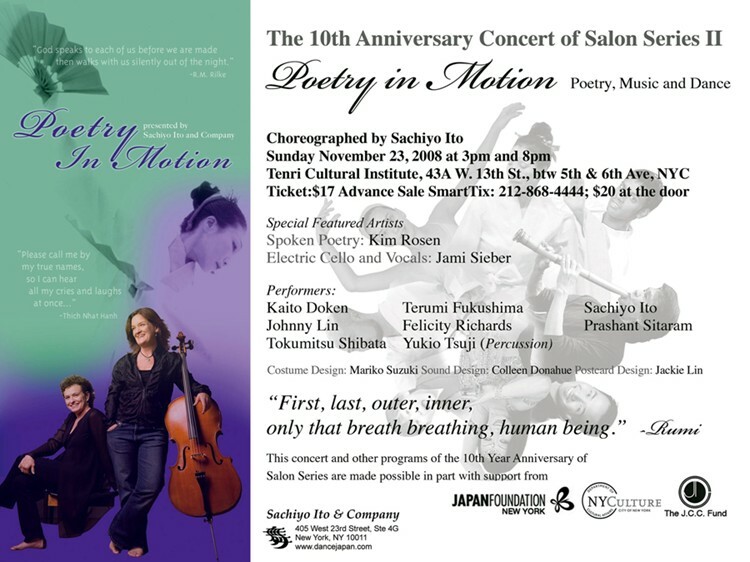 For the last 10 years Sachiyo Ito and Company has offered the Salon Series, a series of informative and educational lectures, lecture-demonstrations and performances aimed at those who are interested in deepening their knowledge of the performing arts of Japan, three times a year on Sunday afternoons at Tenri Cultural Institute, New York City. The unique combination of education and entertainment inspired NY audiences artistically and intellectually, and has served as resources for the Japanese culture and arts. 2008 marks the 10th year of the Salon Series, and the company is celebrating the Salon Series programs with special guests, and also with special concerts. For the last 10 years Sachiyo Ito and Company has offered the Salon Series, a series of informative and educational lectures, lecture-demonstrations and performances aimed at those who are interested in deepening their knowledge of the performing arts of Japan, three times a year on Sunday afternoons at Tenri Cultural Institute, New York City. The unique combination of education and entertainment inspired NY audiences artistically and intellectually, and has served as resources for the Japanese culture and arts. 2008 marks the 10th year of the Salon Series and the Company is celebrating with special programs and guests artists. An Anniversary Concert, Sound of Emptiness, will be performed on May 24th and 25th. This evening-length dance-drama will combine poetry, music, and dance. The work is based on a short story entitled, “Mimi-nashi Hoichi,” written by Lafcadio Hearn in his masterpiece collection, Kwaidan (Ghost Stories). It is the re-telling of a folk tale in which a blind biwa player, Hoichi, unprotected by the Buddhist sutra, Prajñāpāramitā Heart Sutra, loses his ears. Inspired by the teaching of Prajñāpāramitā, the theme serves to recognize that human perception is relative and in constant flux. Even though perception is the first step toward understanding, duality and self-righteousness often lead to conflicts, and even destruction. Sound of Emptiness asks the audience to understand these undeniable aspects of human nature, and contemplate as to how we can resolve them in order to bring about a more peaceful world. The poems, recited by a chorus with live music, will weave through the fantastical dance drama. Audiences will be invited to join in a walking meditation at the closing of the dance drama. Japanese Dance and Okinawan Dance and Music. This program explores modern poetry in the 20th century, focusing on the work of Kotaro Takamura. Also a dance choreographed to Chieko-sho, a selection of poems written by Takamura, Chieko: Genso will be performed to demonstrate a contemporary example of the fusion of dance and poetry. The guest speaker is Hiroaki Sato, a leading translator of Japanese poetry to English. Singers to accompany Chieko: Genso will be Mary Myers and Beth Griffith. Special Guest: Lewis Cook, Ph. D.
Waka, the court poetry of the 11-13th century Japan, served as the central vehicle for many of the Noh plays produced in the 14th century. In this Salon Series, Professor Cook will give a brief survey of waka, and discuss “Eguchi,” one example of Noh based on waka poems and episodes about the legendary waka poet Saigyo. Also, a kabuki dance, entitled “Shigure Saigyo” (Saigyo in the Autumn Rain) will be performed by Yoshiro Kono and Sachiyo Ito. Lewis Cook, Ph. D is a Professor of Japanese and Chinese literature at Queens College1994. He worked as a journalist in Hong Kong, and an editor/ copywriter in Tokyo. His published translations include: Collection of Ancient and Modern Poems (Kokinshu), New Collection of Ancient and Modern Poems (Shinkokinshu), and Tales of Ise.